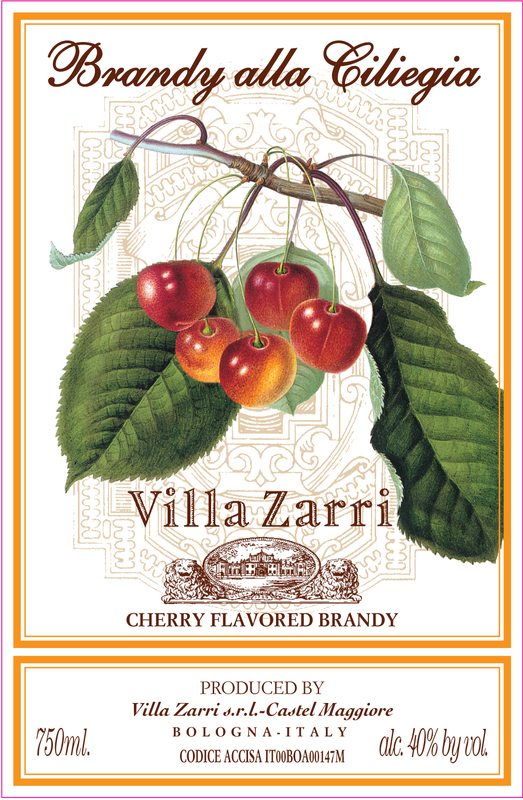 A desire to rediscover and newly promote a liqueur which boasts a blorious past in the Italian liqueur tradition prodded Villa Zarri into producing Cherry Brandy: Villa Zarri brandy, distilled wine aged in small French oak barrels for 6 years, is blended with precious cherries coming from Castello di Serravalle, a small town located on the hills of Bologna, close to the district of Modena, lying within area where the typical Vignola cherries, renowned as the best in Italy, are grown. In order to achieve excellent results, two types of cherries are used; durone della marca and nero second, endowed with extremely different characteristics. The former is a light red cherry with a bitterish taste and thick pulpy paste, which ripens at the end of June. The latter, instead, is the typical cherry of the hills of Bologna; it also ripens in late June, but its color is dark red, shifting towards purplish, and has a very sweet and juicy pulp. Cherries are brewed in the brandy for two months, at the end of which the brandy is separated from the fruits. During the brewing phase, an osmotic process takes place, thanks to which cherries pass on their liquid part to the brandy (water, sugars and aromas), while at the same time they absorb alcohol from the brandy which, in two months of brewing, reaches an alcoholic strength of 40%. At this point, it is ready to be filtered and bottled. Extremely bright and transparent, it shows a ruby red color with lively copper shades. Its scent is enveloping, full, ripe and warm fruits do not conceal a calibrated and stimulating spicy feeling. When it is smelled for a second time, its aromatic repertoire increases and an ethereal and vanilla-flavored note hints at what will be tasted. When it is introduced into the mouth it is indeed sweet and seducing. Its flavor combines ripe cherries with citron frit freshness, only to return to sweet spices: first and foremost pipe tobacco and caramel. The ending is pleasant, harmonic and underlines full and extremely refined olfactory consistency. Serving suggestions: our suggestion is to taste at room temperature ( 64 -68 degrees Fahrenheit) at the end of a meal, either alone or with dry cookies, desserts containing fruit jam or plain chocolate. It is an excellent base for cocktails and long drinks.